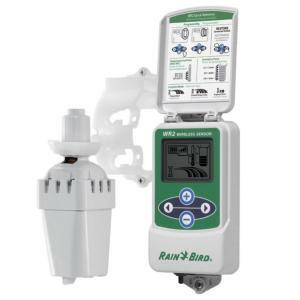 RainBird designed the WR2 Wireless Rain/Freeze Sensor with user-friendliness in mind. This sensor will save time - installation and programming is easier; and money - exceptional responsiveness to rain and freezing temperatures thus improving your system performance. You choose your own rainfall settings and can save up to 35% on water usage while still maintaining a beautiful, lush landscape. Designed for one person installation with a versatile mounting bracket for gutter mount or vertical surface mounting such as a fence or wall. All settings are displayed on the easy-to-read LCD screen, so you can see signal strength, rain and temperature set points, monitor battery life and more at a glance. Dual antennas reduce signal interference from radios, mobile phones, and power lines. Adjustable rainfall settings from 1/8" to 1/2"
NOTE: Not compatible with Rain Bird ESP-SMT, ESP-SMTe, SST600s or SST1200s smart controllers.